Tell us a bit about where you grew up and how you got interested in food? I am from a small town north of Philadelphia. Most of what I remember from my childhood is what I ate. My first lobster dinner at The Oyster House. My grandmother got upset because she said no 10 year old needed a whole lobster. My grandpa beamed when I finished everything. Stopping at the farmers market on the way to the pool in the summers, searching for that perfect black plum. It made me so happy when the fresh juices would run down my arm at first bite. Perfectly ripe tomato sandwiches. Steamers and fried clam sandwiches at Klein’s fish market down the shore. My dad has an incredible sweet tooth, we were spoiled with Halloween candy, Easter candy and doughnuts on Saturdays. (I still look forward to my annual basket of Josh Early jelly beans.) When I found out these were things I could make I wanted to learn how. My mom was a decent cook growing up, but she could not bake. So, I taught myself how with the Joy of Cooking. When I turned 14, legal working age, I got a job at The Bridge Cafe. The Chef/Owner is a CIA alumni and showed me all aspects of the business. Can you tell us about your experiences at the CIA + Cordon Bleu? I had the unique experience of attending the pastry programs at both the Culinary Institute of America in Hyde Park, New York and Le Cordon Bleu in Paris, France. The CIA had state of the art equipment and we made sweets in batch sized to accommodate a commercial kitchen. LCB was the opposite. We made only small batches or individual items. Everything, from whipping meringue and developing gluten in bread, was done by hand. By learning both peering over the mixing bowl and using my hands gave me a better understanding of baking and pastry. What did you think about working in France? After Le Cordon Bleu I staged at pâtisserie Sucre Cacao for 3 months. It was intense. My understanding of the French language was decent but only when spoken to slowly. Chef did not speak slowly. I enjoyed learning the systems there. Production was on a schedule and super organized. We made viennoiserie, macarons, individual pastries, cakes and bread. While I was there, Chef was designing and executing his pastillage showpiece for le Meilleur Ouvrier de France. Can you talk a little bit about your career trajectory once you came back to New York? After Paris, I moved to New York City. I trailed at several places but fell in love with Craft. 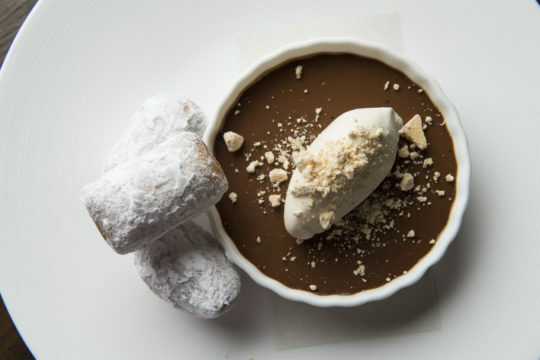 The spacious pastry kitchen, the top quality ingredients, the energy of the staff and the style of Karen Demasco was exactly what I was looking for. I worked there for 2 years before moving to Atlanta, Georgia. I was a pastry cook at Aria, a fine dining restaurant in Buckhead. Then I had the opportunity to open Bakeshop as a pastry sous chef. I was really interested in the operations of a wholesale bakery with a retail space. After Bakeshop I took my first pastry chef job at Serpas, True Food. I moved back to New York in 2011 and worked as the pastry chef at Craftbar. After a year and a half, I was promoted to the pastry chef of Craft and Craftbar. Then,this past fall I took another position within the company as the executive pastry chef at Fowler & Wells in the Beekman Hotel. I was excited to work my first restaurant opening and to learn the intricacies of a food and beverage program in a hotel. Who do you consider to be your mentors? Ken Miller from the Bridge Cafe in Frenchtown NJ, Christophe Marquant from my externship at the Seaport Hotel in Boston and Karen Demasco from Craft NYC. All three chefs had a great impact on my career. Ken taught me about hospitality and encouraged me to go to culinary school. Christophe taught me how to prepare for multiple outlets and told me to go to Paris. Karen taught me about the importance of the ingredient and how to showcase it. What inspires you and how do you approach developing new dishes? I get inspired by the ingredients. I get excited when new produce comes into season. I start by writing down flavor profiles and different techniques then test them out. I usually end up far from my original idea but that’s the fun part of the creative process. Can you tell us about the bread program at Fowler & Wells? 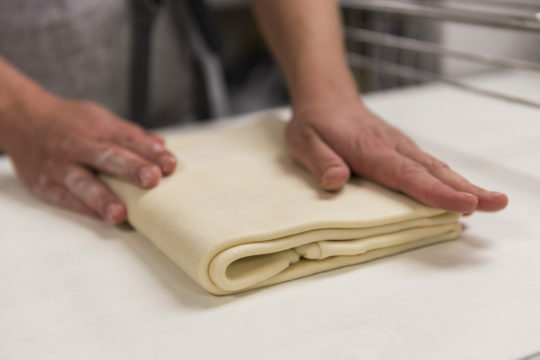 At Fowler & Wells, we make lean dough, enriched dough, sourdough, laminated dough, and unleavened dough. We use commercial yeast, natural levain, and preferment. Between breakfast, lunch and dinner we utilize a variety of breads and pastries. For breakfast we make assorted viennoiserie, bagels, sourdough waffle and English muffins. We bake multi-grain, country sourdough, and brioche loaves to serve as sides of toast. For lunch we have a number of breads for sandwiches; ciabatta, focaccia, potato brioche, and semolina rolls. For dinner we bake off loaves of bread that get grilled and served with a few Bar Room menu options and we are developing a dinner bread that I hope to roll out soon. To be honest not a whole lot but if I do, I keep it quick and simple; sandwiches, eggs, pasta, nachos. Any specific ingredients you are excited about using right now? I love this time of year. The produce is so vibrant and fresh that you don’t need to fuss with it much. A bowl of fresh berries with lightly whipped cream and a hint of lemon zest is what I look forward to in the summer. A more composed version of this would be the Frozen Parfait at Fowler & Wells. It’s strawberries with almonds, lemon posset and amaretti syllabub. There are so many restaurants I want to try that I don’t find myself returning to too many places except Okonomi. Their Japanese breakfast is one of those meals that makes you feel good.